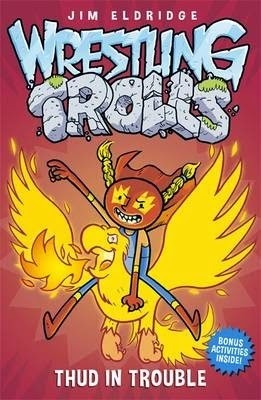 Jack, Big Rock, Milo, Princess Ava, Robin and new friend Blaze are the Wrestling Trolls. In this fourth book in the series, Thud in Trouble, the Wrestling Trolls team is pushed to the limits inside and out of the ring, as they take on the notorious bully Buster Gutt and the villainous Lord Veto. Packed with action, fun and adventure, Thud in Trouble offers two great stories in one. As usual, the team is low on cash, so they plan to come together as a family and make some money by taking on Buster Gutt in the wrestling ring. Unfortunately, Buster is even meaner than they thought, and Jack finds himself and his alter-ego THUD in serious hot water. The team are in trouble a second time when the villainous Lord Veto tries to break up the Waldo’s Wrestling Trolls, ending in a wrestling match. Award-winning and seasoned writer, Jim Eldridge, cleverly weaves themes of friendship, loyalty, and bullying into this entertaining and heartfelt book. With larger text and easy to manage chapters, Thud in Trouble is ideal for younger readers eager to master chapter books. An enjoyable read and complete with fun activities inside the book, Thud in Trouble is sure to engage any young reader. And if that’s not enough, check out the Wrestling Trolls interactive website just for kids.